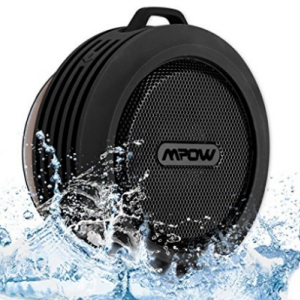 Amazon offering Mpow Buckler Bluetooth Wireless Waterproof Shower Speaker with Mic@Rs. 1299. Rated IPX4 Level: Large area of Sealed Silicone Cover Design ensures great Splashproof, Shockproof and Dustproof function, so it can be used under harsh environment (such as, outdoor and shower). Built-In Mic Hands-Free Speakerphone: pick up a call conveniently by this mini speaker anywhere when it is connected to your Smartphone. Long Playtime, Fast Recharge: Built-in rechargeable1000 mA battery, supports up to 8 hours playing time with a single charge. Recharge only needs 3 hours. Suction Cup & Snap Hook: Portable and suitable features for Mpow Buckler shower speaker guarantee better user experience when playing music in shower/outdoor. Advanced Bluetooth Technology: Connect your device very fast, consume less energy and deliver crystal clear sound.